These people went out of their way to make sure all of our accessibility needs were met. Who knew you could find such a quaint accessible cabin right in the middle of the mountains! This cabin is amazing on it’s own, but they are committed to accessibility and hospitality and it shows! We were late arriving and they waited and helped us unload. Mom comes with 2 lifts, a commode and 3 bags. There was tons of room for everything including maneuvering! The bathroom is gigantic and there are ramps everywhere. Beautiful, spacious home with lots of character and delightful little secrets. The backyard is a dreamy oasis, and there is a little walking trail on the property lined with thimbleberries. Pam and David are warm and friendly hosts! Would definitely recommend a stay here. Thank you so much for the wonderful hospitality. We felt so much at home here and loved this beautiful place and country. I can’t tell you how much we thoroughly enjoyed your “Paradise”. You went well out of your way to accommodate us and our son, who has special needs. He did not want to leave, which is so unlike him. We will return, as this is a promise we made to him and you won’t be able to keep us away. Thanks so much Pam and David for the use of your lovely home. It worked well for us and we had a great time and were very comfortable. Your Slocan Valley is a magnificent place and we had fun exploring it. We had a wonderful time! So much to do in the Slocan Valley. We loved the Winlaw Nature Park. Thanks for the inner tube ride down the Slocan River. This a beautiful valley and lovely house. Thank you so much for the warm welcome, the accommodations to make your lodge wheelchair accessible and the tranquil space. My children were in heaven, checking out all the activity around the pond, the deer sightings and especially – ‘the space’. We will be back. We had the Best Family Reunion! We came from Colorado, Oregon and California. We loved having “Paradise” as our base for fun in the Slocan Valley. Thank you. Thank you so much for a beautiful stay. There was absolutely everything we needed and more! Scenic, comfortable, clean and inviting. We will be back !! Thank you for making it all possible! Our 6 weary paddlers loved everything about your lovely home. Many thanks! I along with some of my family friends spent couple of days in this place. We came from Calgary. The owners, Pam and David, both were so helpful. They provided all the important information about the place, how to reach there, provided us many detail maps and many more. While our stay, we found Pam so much caring. She treated us like her own guest. There are ample amount of space in the house. Very big and pretty new BBQ machine, fire-pit, nice veranda, big kitchen. I strongly recommend people to be the guest of Pam and David. 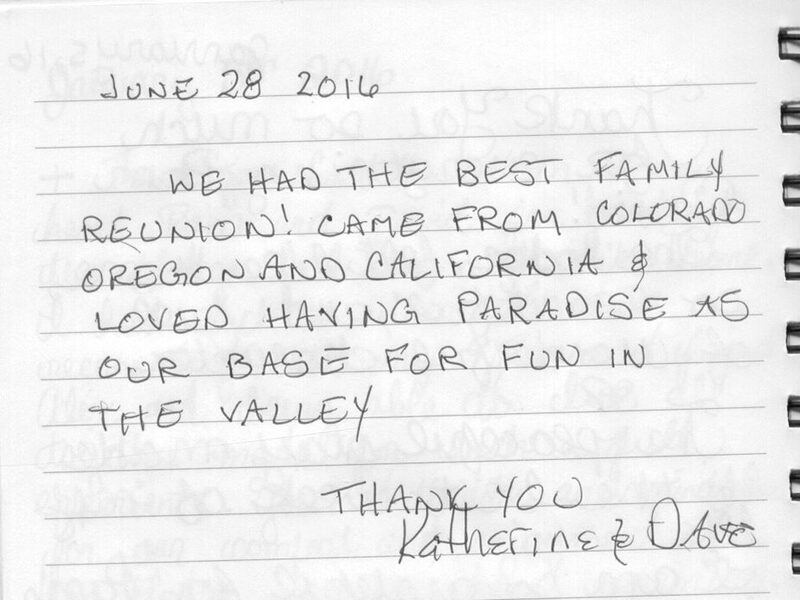 This is our second stay at Paradise Valley Lodge and it was even better the second time! Pam and Dave have added to their organic garden and we felt very lucky to be visited by many big blue dragonflies every day at the pond. We got some great pictures and came back home very relaxed. It’s great to have a washer and dryer and the two full washrooms. We enjoyed the upstairs screened in porch for a spectacular lightening and thunder storm, and stayed nice and dry. The Lodge is within walking distance of a few great places to eat, and very close to the Slocan Valley Rail Trail where we biked multiple times. We have found Pam and Dave to be great hosts and very happy to provide suggestions about where to go, what to do, and how to get there. This is our favourite vacation spot when we head out to the Kootenays! The house was clean, well stocked, and pleasing to the eye. Pam can not do enough for you. The place has a wow factor of ten. My group of 10 came out for a week over New Years for a ski vacation. The lodging was excellent and Pam and Dave were super accommodating and helped make the stay what it was! Very clean, lots of space! Full kitchen with any item imaginable. On behalf of the group we would all recommend it! The location was ideal enabling us to access two amazing mountains (Red Mountain and Whitewater). For our off skiing days there was lots to do in the area and the recommendations provided by Pam and Dave were very helpful. My group and I would stay here again! It was a pleasure for our large wedding party to stay here. The Lodge catered to our every need and we were impressed by the spacious lounge area with adjacent kitchen. It was equipped with electric and gas stoves, and 2 spacious refrigerators. The large comfortable bedrooms overlooked well-kept grounds for camping. Although we were a large party, the spacious bathrooms were more than adequate for our needs. 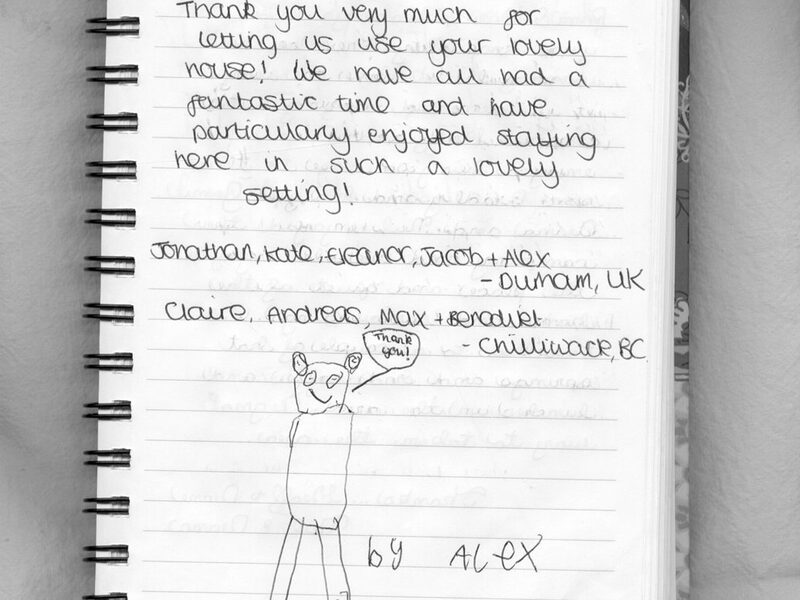 Each guest felt that this immaculately kept Lodge, had been a wonderful place in which to stay and would recommend it to others. The house was great. It was: clean, comfortable, lovely garden, comfortable beds, fully equipped with everything we could possibly have needed. Pam and David, the owners, live in the house next door and were very helpful suggesting places for us to take the kids, go for lunch, and answering all of our questions. The house is also excellently situated for exploring Nelson and the surrounding area. We had a great week! We chose Paradise Valley Lodge for our honeymoon. We love the Slocan Valley area and this was a great base for us to hike, ride our rental bikes along the Rail Trail, eat at local cafe’s and take quick trips into Nelson. The Lodge was the absolute cleanest place we have ever stayed! It was great to have the second bathroom. The bed was very comfortable, the screened in porch was lovely in the evening and we also enjoyed watching and photographing different birds in the garden. Our hosts were friendly, helpful and ensured our stay was comfortable. We will definitely be back! The house was perfect for our needs, we had two young families stay for three nights, it was great to hang out but not feel like we were walking all over each other. The Kitchen is very well stocked, there is no need to bring anything (knives, bowls, blenders, coffee makers…) Pam and David have filled it full. Its a traveling cooks dream. The BBQ is top of the line, I wish i could have taken it home with me. The back yard is beautiful and is great for outdoor dining, and sitting around the fire pit. Winlaw is a very unique town, even though it is small it still has a lot to offer. We most enjoyed the ‘Sleep is for Sissies’ Coffee shop and eatery, local playground, geo-caching on the Rails to Trails, and going to the Winlaw nature park. Most importantly Pam and David are great hosts.